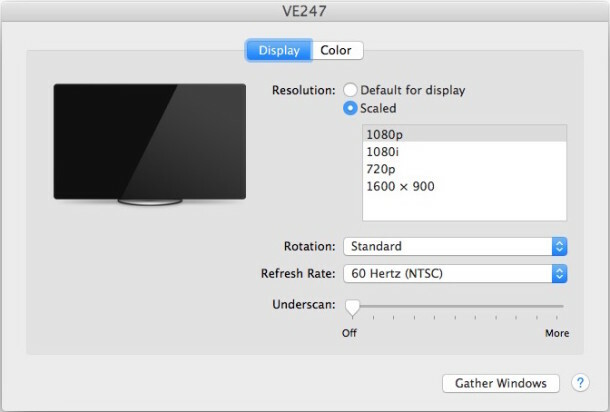 Though it’s generally recommended to use the ‘Default for display’ screen resolution option, Mac users who connect their computer to an external display or TV may find it helpful to be able to see, access, and use all possible display resolutions for a particular screen. This can be particularly useful if a display is either showing at an incorrect screen resolution, or if you’d like to use a specific resolution that is not shown in the available ‘Scaled’ resolutions list of OS X. 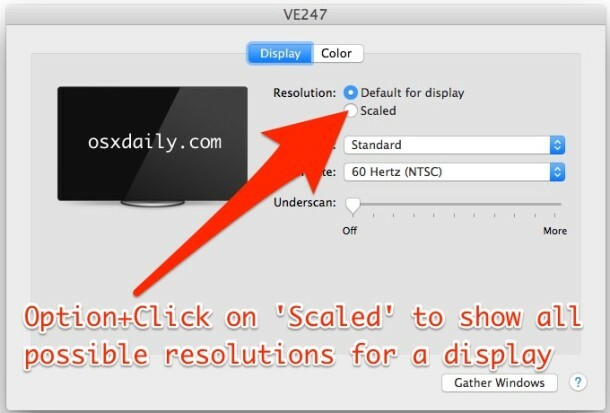 You must hold the Option key when clicking on ‘Scaled’ to reveal all possible screen resolutions for the external display(s), and if you have multiple external displays in use on a Mac, you’ll want to hold the option key when choosing “Scaled” and selecting a resolution for each connected display. Though these additional choices become available, they may not necessarily look right, and they may not render correctly, so just because they’re shown as options does not necessarily indicate you should use them for that particular screen. Note this does not apply to Retina displays, where changing the resolution is a bit different and is only offered in scaled views rather than numerical resolutions anyway. As mentioned above, sometimes this trick can be necessary to be able to select the proper screen resolution for an external display, which, although it’s pretty rare, can present itself as an improperly set screen resolution, usually at a lower resolution than what the display can handle. 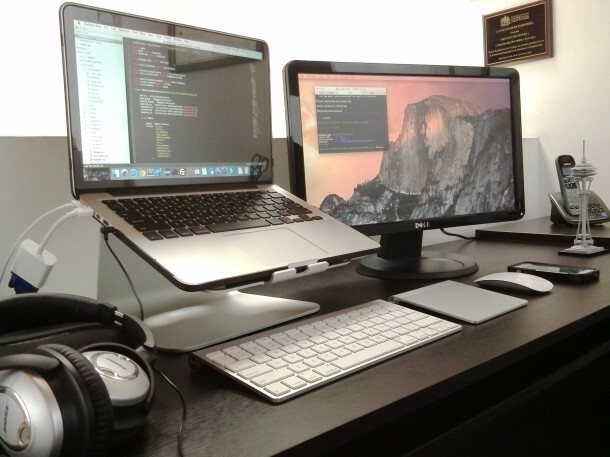 If you encounter that problem, sometimes simply using the Detect Displays feature after disconnecting and reconnecting the screen to the Mac can be sufficient to have the external display find and use the proper screen resolution. In the ‘Display’ settings, you can also auto detect display resolutions with CMD + F2 (or if you have reversed the default fn/function keys, fn + CMD + F2). It may also help to use CMD + F1 to toggle mirror displays on and off (or fn + CMD + F1). ‘Display Menu’ is a small free App that’s way better. Man! That app fixed my troubles!! I have a JU7500 Samsung 4K as my second monitor and I could only get three potential resolution using the option->scale method. ‘Display Menu’ gave me a LOT more options and the old 1920×1080 60Hz was what I wanted! Had to comment on an old thread just to say thanks!!! Like Scott said DISPLAY MENU app is amazing helped me fix an old TV monitor that wouldn’t display the correct aspect ratio. Thanks for the tip Laurence! This information has made my day! Thanks guys!! I have the new imac 5k, and there are so few options in resolution, at 5120 x 2880 most stuffs get unreadable, or requires a great effort to read, also the small pointer get so small you barely can find it. at 3200 x 1800 I can use ok but I would like to put more programs at the screen and you barely can but two browsers without conflict. There is a way to get some resolution between the 5120 x 2880 and the 3200 x 1880? MAC is not predictable sometimes :/! I have a MacBook Air 13”, and when connecting a Monitor, (which support high resolutions) the Mac will only recognize 800 x 600 and 1020 x 1024, which REALLY looks bad, is there any way to force a resolution? Using the cmd + alt trick, it will only display those 2 options available. I love you. This saved my a$$. Thanks a lot, that was a really great helpful piece of information. Without knowing it I was feeling like what a big trouble I am in. But such a small knowledge sharing from you just saved my day. Thanks once again for your generous effort to help people like me! Thanks for this fix. I have spent a whole day trying to fix one screen res. There is nothing on the Mac forums saying this, so thanks again. Such an easy quick fix. Just wanted to thank Laurence for suggesting the “Display Menu” app. Only thing that has worked for me as I have been having issues logging in via screen sharing on my old mac mini which I run headless as a media server. It was unable to detect a resolution as there was no display connected, the app worked flawlessly! Thanks! Although it annoys me that Apple hides things like this…. Thanks a million for the option/alt cursor over “scaled” maneuver! Thanks so much! I was having trouble with a new 4K external monitor that System Preferences was showing its top resolution to be only 1960×1080, even though the previous monitor had also been a 4K. This allowed me to overcome the Mac flaw and choose the proper setting! What I din’t get is why Apple still thinks 800×600 is the “optimal” resolution for external monitors/projectors… except their own lol. Thank you so much for writing the helpful article. On the web, I don’t get a solution to my problem. Even I changed the monitor also but my Mac Mini Monitor resolution cannot be changed. Suddenly I got the solution and be able to fix my monitor resolution. Thanks again to the Admin. Well, holding down the Alt key does let me see a lot *more* options. Unfortunately, the resolution of my new monitor (2560 x 1440) wasn’t in the list.